To celebrate the 40th anniversary of its first in-house quartz movement, the famous ultra-thin 7P calibre presented in 1976, Piaget unveils the Emperador Coussin XL 700P: an astonishing concept watch issued in a 118-piece limited series. Featuring an unusual match between a mechanical calibre and a generator, this resolutely innovative timepiece highlights two perfectly mastered skills embedded in the very genes of the Manufacture. 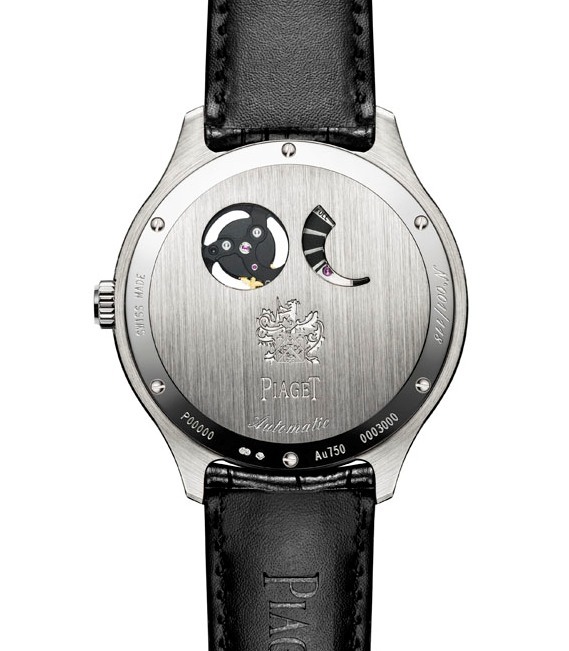 For while Piaget stands out for its expertise and creativity in the development of ultra-thin calibres, it also has its own range of quartz movements equipping many of its ladies’ timepieces and jewellery watch creations. In tribute to this dual excellence, the mechanical heart of the Emperador Coussin XL 700P is regulated by the high frequency of a quartz oscillating at 32’768Hz which controls the speed of the generator at 5.33 turns per second. This exclusive ‘motor’ boasting peerless precision is housed in a cushion-shaped case with a diameter of 46.5 mm, displaying the noble distinction of the Black Tie collection as well as the boldness of its powerfully structured lines. Piaget’s excellence in the domain of innovative mechanical movements, and particularly its mastery of ultra-thin horology, is widely acknowledged. With the Emperador Coussin XL 700P, driven by a generator-regulated mechanical movement, the Manufacture pays tribute to another form of horological expertise that has been fuelling its creativity for 40 years: the development and production of Piaget quartz movements. This range of proprietary calibres was born in 1976 with the 7P, which was entirely developed and produced in-house. 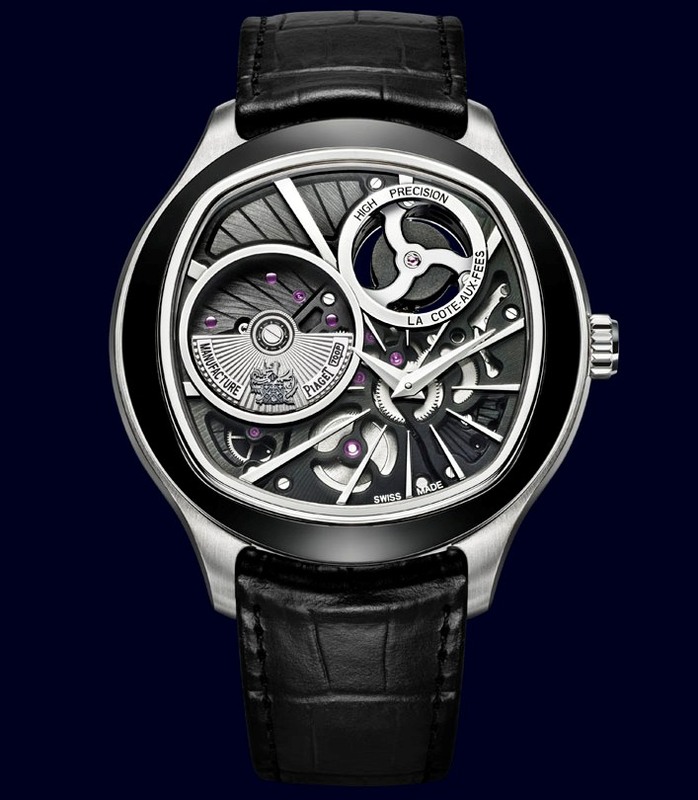 Amid the quartz revolution and in the wake of the first Swiss achievements in which Piaget played a part (including in 1970 with the famous Bêta 21, developed by the Centre Electronique Horloger in Neuchâtel), Piaget once again demonstrated its watchmaking know-how and its capacity for innovation by creating its own movement. The latter was at the time the thinnest in the world at just 3.1 mm thick. Ever since, Piaget has regularly enriched this range of high-performance quartz movements powering most of its ladies’ and jewellery watch models. In revealing an unprecedented calibre representing a daring alliance between mechanical and quartz-driven movement, the Emperador Coussin XL 700 unites these two historical fields of expertise in a contemporary creation with an emblematic architectural design. Issued in a limited edition of 118, the exclusive Emperador Coussin XL 700P is equipped with an ultra-thin generator-regulated mechanical movement. This standout timepiece represents the first time that Piaget is combining the reliability and precision of Swiss Made electronic regulation with its iconic reverse-construction calibre. This accomplishment, for which ten or so patents have been filed, stems from two years of R&D conducted within the Manufacture Piaget and is based on an original Swiss concept first registered in 1972. At that same time, Piaget was illustrating its technological dynamism by developing its own ultra-thin quartz movement, the famous 7P. 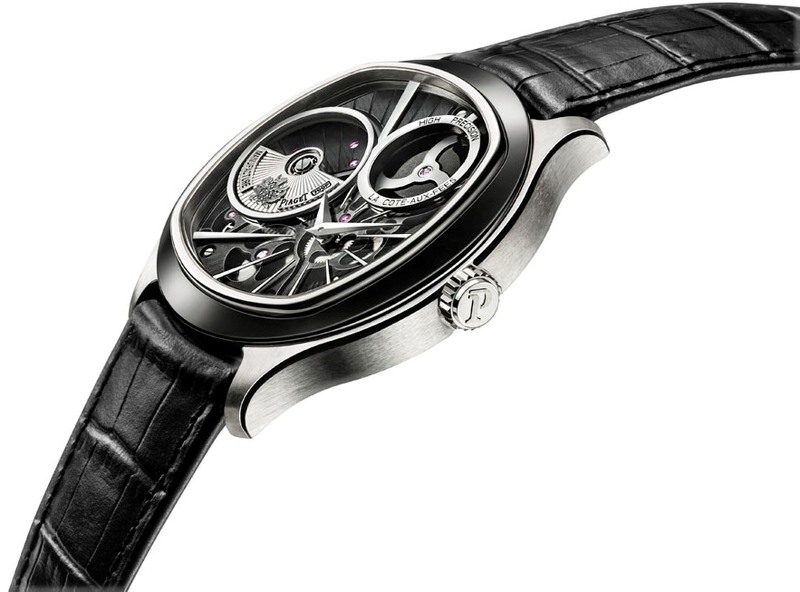 In tribute to the latter, the Maison has decided to name this new electronically regulated self-winding calibre “700P”. The quartz with its 32’768 Hz frequency controls the rotation of the generator and wheels train. It ensures an extremely high degree of precision as well as perfect resistance to magnetic fields and gravity. This device rotating at 5.33 turns per secondis housed at the heart of a mechanical movement featuring a highly distinctive architecture which supplies all the energy. On this fascinating reverse (or inverted) construction, revealing the main functional elements of the watch on the display side, the offset oscillating weight and the generator form a figure 8. The also offset pointed hours and minutes hand sweep over finely tapered hour-markers. 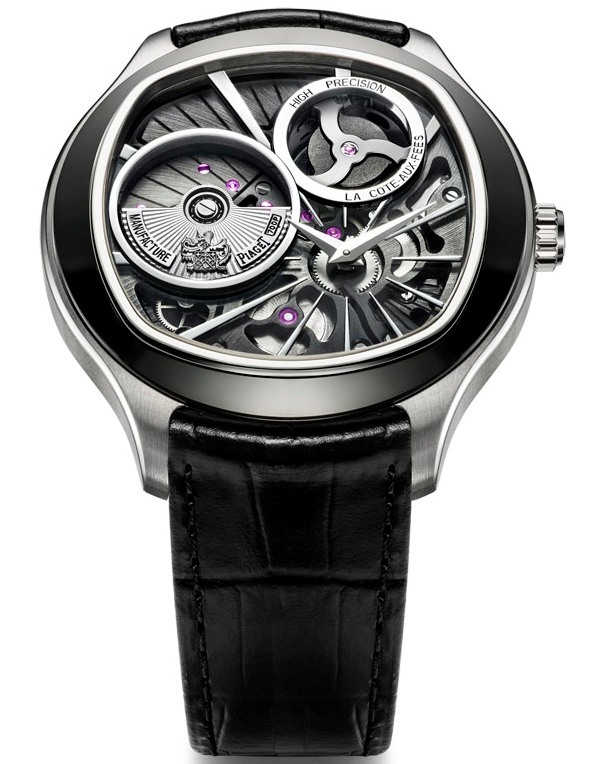 In the notable absence of a dial, the black-coated cushion-shaped movement displays its meticulous traditional finishes, such as the guilloché micro-rotor adorned with the Piaget coat-of-arms, sunburst and chamfered bridges, circular stain-brushed wheels and silver-toned screws. The deep black shade of the calibre is matched by a black ADLC-coated gold bezel. Through these sophisticated touches and plays on contrast, the Emperador Coussin XL 700P clearly proclaims its membership of the Black Tie collection. Framed by a 46.5 mm-diameter white gold cushion-shaped case topped with a rounded bezel, this timepiece expresses the DNA of the Manufacture and the cleverly mastered art of “shapes within shapes”. Its resolutely modern design is the ideal showcase for the innovative 700P Piaget movement that is admirably highlighted through a clever blend of tradition and innovation, boldness and refinement, mechanical prowess and technological precision. 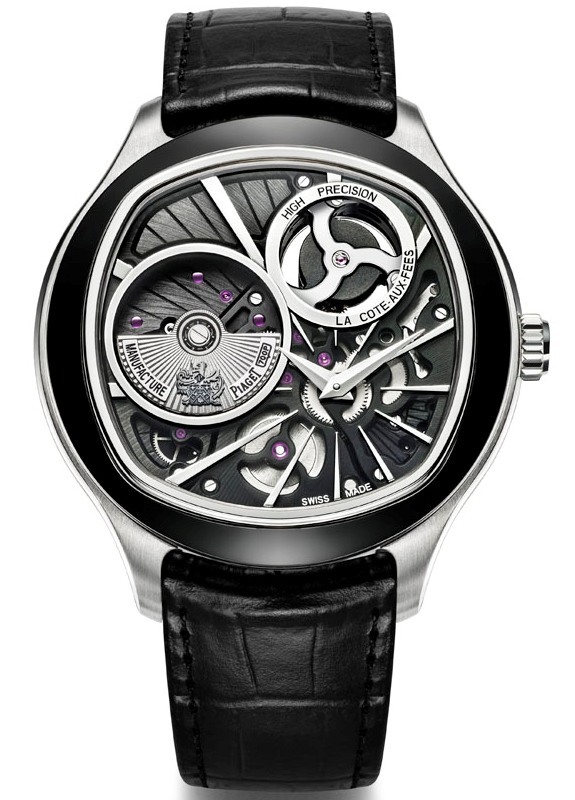 Manufacture Piaget 700P black coated ultra-thin self-winding mechanical movement. Finishing: Circular côte de Genève, circular-grained mainplate, bevelled bridges, engraved oscillating weight with Piaget coat-of-arms, silvered screws.